Along the way I took a picture here and there and just around the corner from home, took this one which inspired a little Haiku! This entry was posted in Haiku and tagged haiku, tree bark. Bookmark the permalink. LOL….that’s a good one. I won’t ask what inspired it. Ha ha! I don’t know…just the way the bark was all over the place. Can’t explain where the thoughts go! Excellent! Just what I like to read! Thank you. 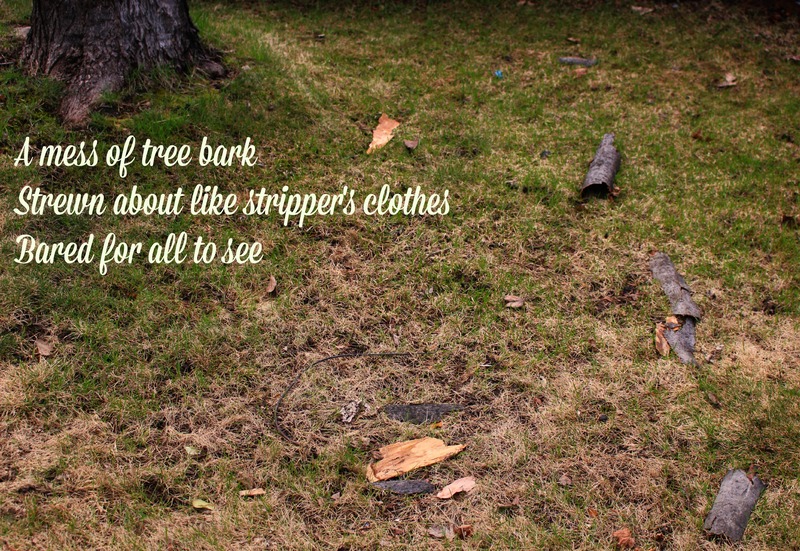 Loved the Haiku – especially the juxtaposition of nature and stripper’s clothes! Oh, that is just too funny, Dale. What a naughty tree, stripping off like that in public! I’m sure it’s bark is worse than its bite. Right there, smack-dab in front of everyone! No modesty whatsover! I noticed the trees had been stripping in the woods that I walk in. It must be the time of year for brazen behaviour! Simple yet effective. It’s funny how words can make you see something new! Love it Dale, you saw bark and came up with a great image!